The first thing we have to do is take a look at our page, and figure out what static elements will become dynamic, and what type of dynamic element will they become. In this example I have broken our comp down as as a guide to show what we need to create in order to turn this into a more dynamic and content managed site. Now that we know what we will need to create we can go ahead and remove those areas from the actual site leaving just blank cells which we will fill in with new dynamic elements. 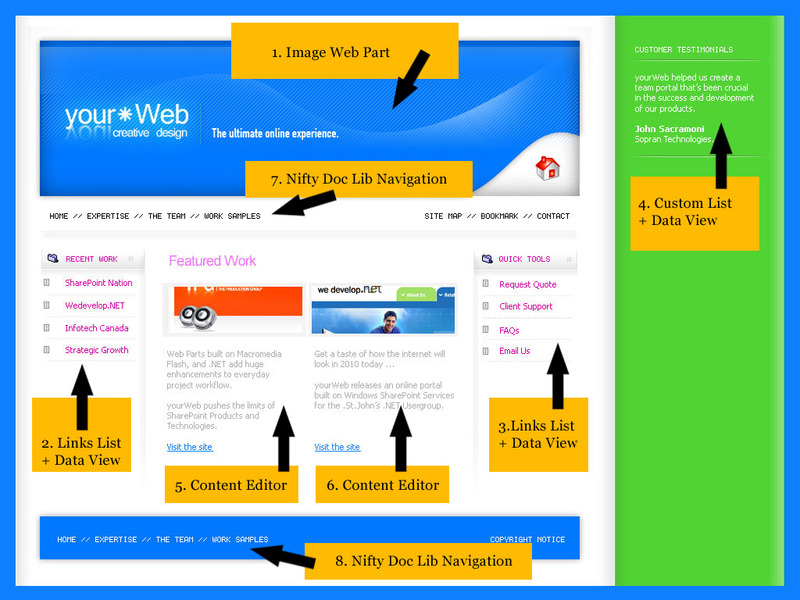 This example is prett much what my site would look like at this point. 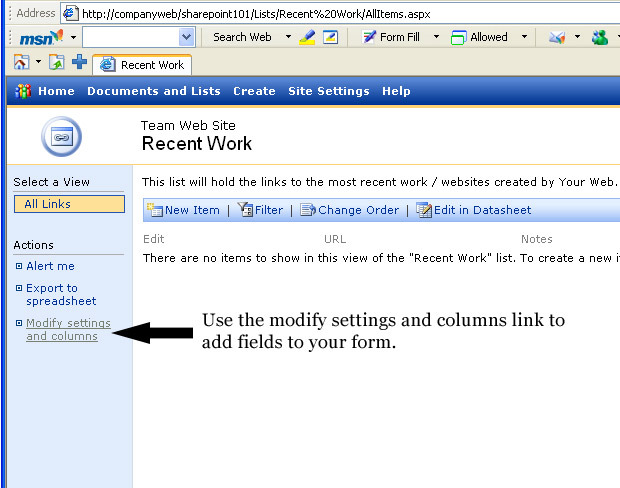 Create the lists and libraries (on the SharePoint side). The next logical step is creating the lists and libraries (dynamic elements). 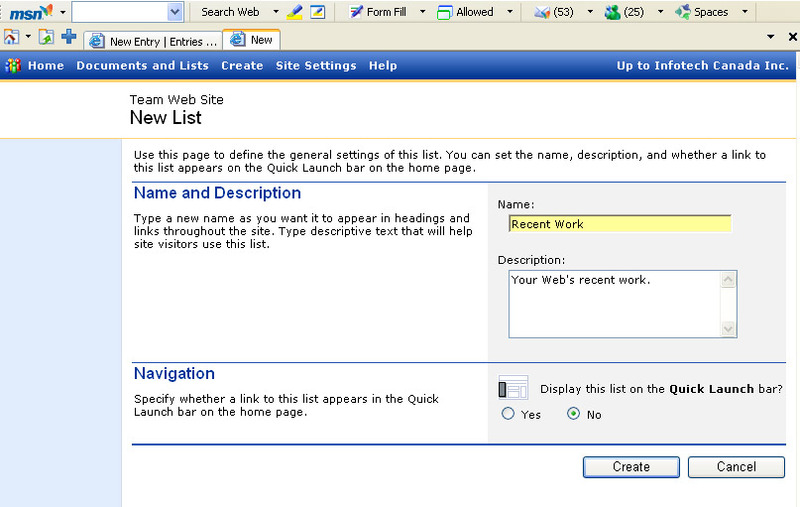 In order to create the lists and libraries you will need to visit the create.aspx page located in the _layouts/1033 folder. So open up your browser, and point it to http://YOURSITE/_layouts/1033/create.aspx. From here you can see a variety of different out-of-the-box dynamic elements that are quite easy to set up. Let’s run through a couple just to get your feet wet, we will start with our left column which we decided would be a links list, this list will replace the former “Recent Works” links. Setting up a Links List. Step 2. Click on the “Links List” to create this list. Step 3. Name your list, in our case we’ll call it Recent Work. Step 4. Add your description, select NO for quick launch, and click create. That’s it, you have just created a dynamic list capable of capturing data via forms and storing it in a database … all without a single line of code! – Pretty neat huh? 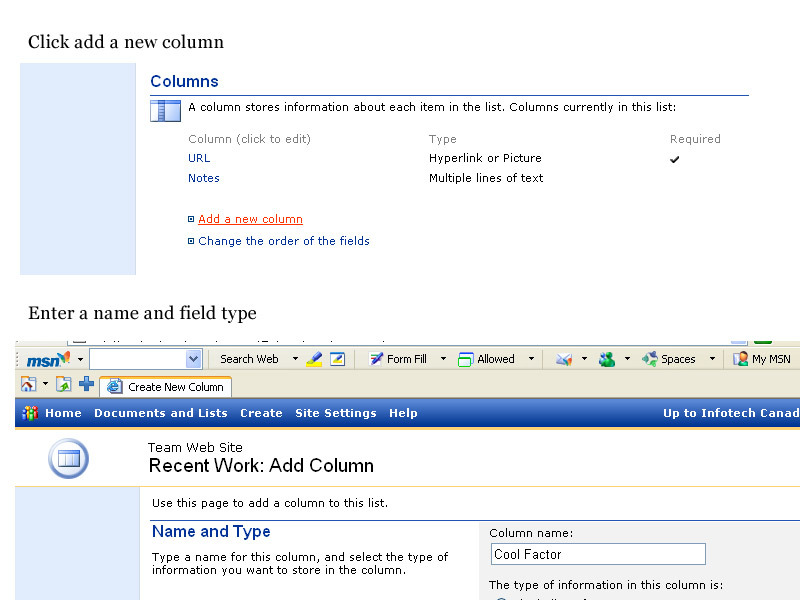 If the base lists that come with SharePoint do not capture all the information you want you have two choices, a) You can create a “Custom List” and add all the columns yourself, or b) Create a list based on the cloest match to what you want and add to that one. Each (Field) in your form for capturing data can alternatively be known as a “Column” – So if you wanted to capture (Company Name) in your form, Company Name would be a column. Let’s assume you have THIS list, and you want to add another option where they can select whether or not the link is “Cool!”. 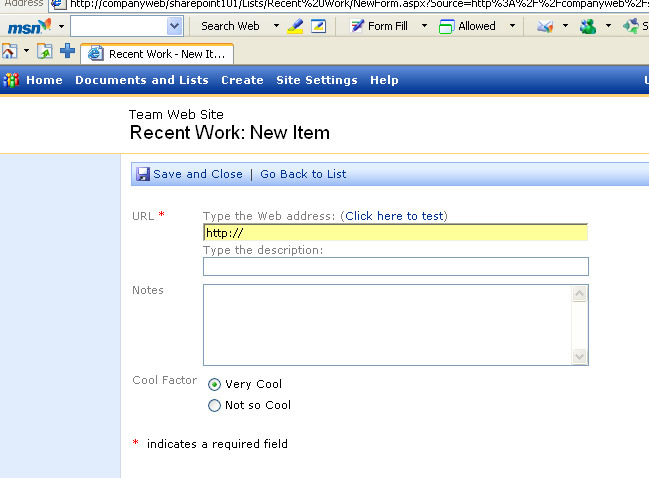 Click ok and you are all done, you just added another field to your form, again without writing a single line of code. The same idea goes for most all lists, and document libraries so I’ll clue this up here and go ahead and create the rest of the lists and libraries behind the scenes. Importing the lists/libraries into our site. Using the “data-view” web part to create a more flexible and stylish look. and finally backing up our work and taking a look at the final product. First, thank you very much for sharing this information. I am new to SPS/WSS and trying to learn as much as possible as quickly as possible. So, I am very interested in downloading the entire (or whatever is completed so far) tutorial so I can work on it offline (I spend a lot of time on planes). Is a ZIP file available? This is hands down the best tutorial I have found for this online. The only problem is that it isn’t finished. PLEASE FINISH! Can anyone point me in the direction of a similar tutorial for making a webpage with sharepoint for designers?. The documentation on this is almost nonexistent! I’ve just read Part 1-9. It’s very informative. Looking forward to the rest!